If you ignore this, you will always start crying. Real programmers use machine code! The fact is when the control loop is "slow" an abrupt load change at the output will propagate "slowish". Thus it will not track properly. If the user not1xor1 made the LTSpice source public, we could have played with it and finalize the efforts of the contributors.. I have no problems with your opinion, because you are entitled to it. I hope that my remarks shock it this topic a little up. If you are aware of my technical remarks and you know that they are correct, why didn't you help the people in this topic? On this forum you can find a lot of information on how to make a good power supply and dummy load circuit. But I get the impression that people are getting more and more lazy while the info with a little search is easy to find. I will also keep an eye on the topic en help if necessary. Here is a link about stability, there are more in this series, change the last digit in the link. Here is the loop model, you may play with it. The output is set to 15V, the Load is pulsing 10mA/5A, 100us edges. PS: I would use a higher voltage at the opamp input, ie. 0-10V for 0-30V output (see the 20k/10k divider). With the values as depicted it seems the response is "the best". Mind it is an simulation only. The values of 1 nF and 220 nF look much more reasonable, maybe a little on the fast side. For the regulator it could help to have a capacitor with noticeable ESR at the output. So something like 100 µF with 0.1-1 Ohms in series. For tuning it can help to look at the response in the frequency domain, e.g. with a load as AC current sink (at both a low and high DC current). For the final tuning also C3 would come in. I would expect a smaller value here to be better. Another point to adjust could be the 56 Ohms resistors - they don't have to be the same. A little more at the emitter could be better if C3 is there. Imo, try this if you want to test. Remove Q3, R5, C1 and R7. Use a diode between R1 (make him 100 Ohm) and the anode of the diode on the base of the BD243. Place a 4K7 resistor between the base and the emittor of the BD243. Make the currend source I1 10mA. Connect V2 opamp power supply to V3, so remove V2. Watch your opamp inputs, are they still connected the wright way in this test setup? The problem with the schematic and many schematic of power supplys. 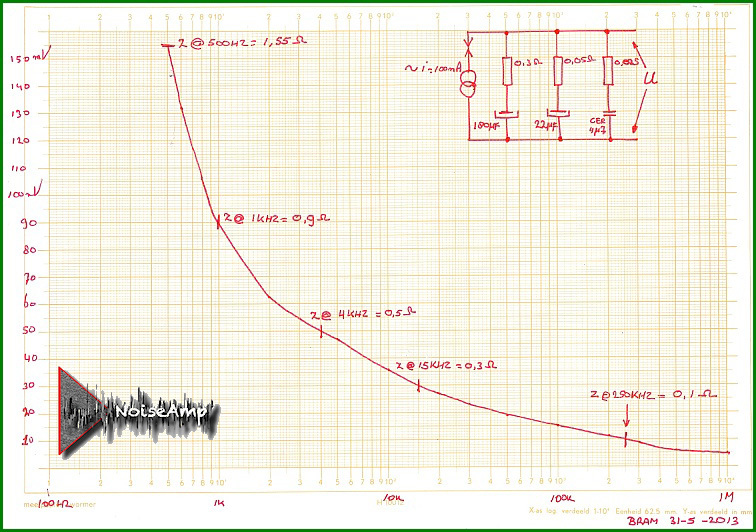 The average opamp has between 55 and 65 degrees phase margin. And for a good stable linear power supply, you need at least 45 degrees phase margin, 60 is better. If one or more transistors are behind the opamp, these transitors slow down the loop in which the opamp in the transistors is placed. These transistors all eat a bit of the phase margin. Below the 30 degree phase margin you come into the danger zone. Please , please, please, do not disregard this information, because it always goes wrong if you do this. It doesn't matter if you are developing a linear or a switching power supply or an electronic dummy load, this is always the case! See my previous post with links to info on this topic from the TI website, first class info from TI! I posted the LTSpice source - see above - you may download it and play with it as you like..
You have done a nice LTSpice simulation above - you may try with say 15V output, switching from 10mA -> 5A -> 10mA output current (with, say, 200ms period and 10us edges) and adjust the loop when required.. I got inspired by another circuit posted in a different thread by xavier60 (see below), but I used the dual voltage boost (common emitter) stage to tame open loop gain by local feedback, that is a sort sziklai with gain greater than one. Such circuit makes it much easier to compensate and variations of the compensation capacitor are not critical (at least according to LTspice) so you can choose between faster or more damped...and you even save a BJT . I'll show the circuit later (I want to read the other messages in the thread before). BTW the BJT in the current control feedback is another interesting trick, although I found it works much better, preventing overshots with no recovery delay, when used to avoid saturation by keeping the output of the voltage control opamp just a bit below (or above depending on the topology) the output of the current control one. I have to run more simulations to be sure it works in any condition though. I apologize for my laziness, I've little time and to post the source I should have chased lib files in my folders and made a zip as various models (lm358, tip41c) are not included with ltspice. That has been discussed before and I also posted a couple of schematic diagrams showing that there is no need for a common emitter BJT in the loop. I did not mind posting the simulation results, but both circuit have safe margin (70-90° or greater) as showed both in AC and transient simulations. here is the circuit with the local feedback. Unfortunately it has a really ugly short-circuit recovery overshot. here is for comparison the previous circuit I posted, with just an opamp as voltage controller. What a presumptuous, patronizing fellow you are. Rather than being so opinionated perhaps it would be better is you read the previous posts on this thread. You will have, no doubt read the posts about the compensation being too heavy. Don't worry about this, it is intentional, as I have previously stated. There is little point in fine tuning the compensation until the PSU has been prototyped and tested. Once that is done we can optimize the stabilization, if necessary, by a few simple modifications, mainly capacitor changes. In common with many PSU designs, the approach is that the opamp voltage servo loop defines the absolute DC output voltage and also provides the very low frequency currents, the big electrolytic capacitor provides the medium frequency currents, and the solid capacitor (ceramic) provides the high frequency components. You can get a more in depth coverage of this area from the manufacturers application notes and from individual component data sheets. As I said already, lets see your full circuit to meet the OP's request- or are you the one who is lazy? I'll see if I can simulate it. Be great if you did do a bode plot of the circuit. I simulated just AC. The bodeplot doesn't look so good. It needs some more work on compensation. I had missed this simulation that you did for the pre reply #89 circuit. Thanks a lot- very interesting. What is the battery on the non inverting input of the opamp doing there (the reference voltage is the variable). R13, R20, and R21 are 56R. You're right. I had overlooked the fact that the reference voltage was on the inverting input. Of course the local feedback is affected by the resistor in series with that input, but there is little difference between 10k and 11k (i.e. the pot at its minimum) of source resistance. I also changed the transistors and the resistors, anyway the bodeplot is still ugly . I tried to compensate the circuit in a different way and it improved a little (phase margin in the 50-70° range according to the load). But I've no idea if that might work in the real world. Later I'll run a transient load simulation. Nice work- thanks. I am just digesting the sim results along with breakfast. Thank you for the insight of my psyche, I didn't know that yet, keep up the good work! Your last scheme looks better with R7 1-Meg and C2 4N7. But because of the amplification in Q6 it becomes difficult to get the whole stable again. Because of this you need C7 1N and R14 1K. I think it is useful to know, that for every ampare output current you need about 50uF over the output, as a rule of thumb. With this kind of "standard" circuits as in this topic, use around 50uF/Ampere for good dynamic behavior. I always use the BC337 as in your circuit Q9 to limit the peak current. and then with an extra opamp make second loop for an adjustable current control. 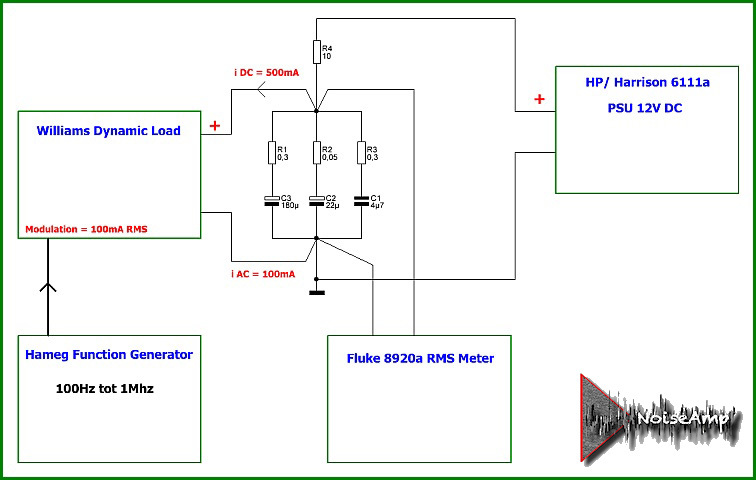 R2 and Q9 then limit the current a little above the maximum current the power supply should supply. Q9 is much faster in responding than an opamp loop. So in case of a short circuit Q9 protects your power trasistoren and your D.U.T. better than the current loop. But only if you make C7-1nF and especially the previous schematic C8 of 100uF that your surge protection with Q9 will not work! The high value of R16, 240K can make a nice noise contribution. C1 of 10pF is too small, I take depending on the total circuit setup here 10 to 100nF. A larger value helps to reduce the noise contribution and parasitic capacities. But an extra resistor is needed directly at the opamp input, this to protect the input during short circuits. Then the energy in C1 is partly dumped in the opamp, one or two diodes also help to keep the opamp intact in these error conditions. If the opamp itself already has diodes, take into account that you usually should not exceed the 10mA peak current in or out a opamp input! Furthermore it is good to think about bias currents, the LM358 is in this respect an old opamp so that higher bias values are unfavourable for the noise contribution and offset drift specifications. Most power supply circuits will exhibit undesirable behaviour in the transition area between CV and CC. And then it also depends on the amplification of the circuit (R16 and R17) and the current on which the power supply is set. That's the hardest part of designing power supplies. Spyce helps, but you will also have to build a test circuit to run into things Spice can't do for you. No sweat and thanks for your informative and helpful post. I also changed the transistors and the resistors, anyway the bode plot is still ugly . Breakfast was nice, but I choked on the sim results. So much for my initial slug approach to get the circuit going. Your compensation looks good for the initial configuration so, if it is OK with you, I will embody it in the schematic of reply #89. For low noise the feedback divider should not divide much more than really needed to stay inside the OPs working range and the practical reference range. So maybe up to 5 V after the divider. For a 30 V maximum this would be something like 51 K and 10 K. It helps to have the divide by 6 or similar stage, as in this case the simple capacitor in parallel to the upper resistor can be well used in the frequency compensation. Even the 240 K and 10 K divider is not bad because of high impedance, but more due to the high divider ratio. So 24 K and 1 K would be nearly as bad. With a TL431 or similar reference one would still have quite some noise from the reference itself. So only at small voltages (e.g. < 2 V) the noise from the LM358 would be really relevant. The extra transistor stage with gain makes the compensation quite complicated. So unless really needed because the voltage goes higher than the OPs output range, I would avoid the extra gain stage and directly control the Darlington output stage from the OP. To get a good regulation over a wide range of loads, including low ESR capacitive loads, it really helps if there is some output capacitance with ESR. There is a reason that nearly all lab supplies have some electrolytic capacitor at the output - though one may not need as much as often found. This is not just for the capacitance but also for the ESR of the electrolytic cap. The output ESR is kind of part of the compensation scheme. As a loss to the capacitor it still has an effect if there is an external load that includes a capacitor with less ESR. For the phase margin one should have a really good phase margin with a well behaved resistive load. With a tricky load like low ESR capacitor plus current sink the phase margin will go down. This is acceptable and essentially unavoidable. Still a good phase margin with a resistive load does guarantee stability with a difficult load. So it might help to adjust the compensation for the difficult case first and only than check the easy case. The LM358 is a slow opamp and with a well-designed circuit it should provide a reasonable power supply with the 2N3055 transistors. The TIP41 and the 2N3055 are both "slow" transistors and they do not help to make the circuit stable. Hint, make the base emittor resistor a little lower say 56 or 68 Ohm, which helps with the paracit capacitors of the 2N3055. So if someone present here a schematic with 2N3055 transistors, then you will actually have to take into account the worst version when it comes to loop compensation. then you have power stage that does not affect the phase margin of the LM358 much. Can it be done with Q6, look at several HP power supply schematics, do not forget the ferriet bead. Suppose we take 4x a 2SC5200 and a max 5a power suply. there is then a little extra for the emitter base resistor, say total 70mA. Drive this 70ma with a BD139-16, Hfe > 100x, that makes the base current of the BD139 below 1mA. Make a 5mA current source and a diode from the opamp to de base of the BD139 to sink the current. This makes a fast power stage that does not affect the phase behaviour of the opamp very much. This is a setup how i tested, to make a good RC section over a wide frequency for the design i was working on. I prefer the Harison setup with a floating power supply for the opamps, the extra transistor is olmost never necessary. More than enough information for the holidays. The slow 2N3055 were the more robust old style transistors. One hardly finds them any more. However the once popular 2N3773 are usually still slow. For a high performance power supply it really helps if the transistors are fast, but for a simple low cost supply one can still use the normal 2N3055 or TIP35. It still helps if the second transistor in the Darlington configuration is fast. A low power the BD139 is a good choice, at higher power something like D44H11. A slower supply would need a larger output capacitor though. @blackdog: the links provided are interesting, but have a trailing / too much.